Thank you to everyone who entered my Stanley Cup Contest. More than half the slots were filled, which I'd consider a success. I'm a bit surprised that no one claimed the Bruins - but not nearly as surprised as I am that the Columbus Blue Jackets are dominating the Tampa Bay Lightning. 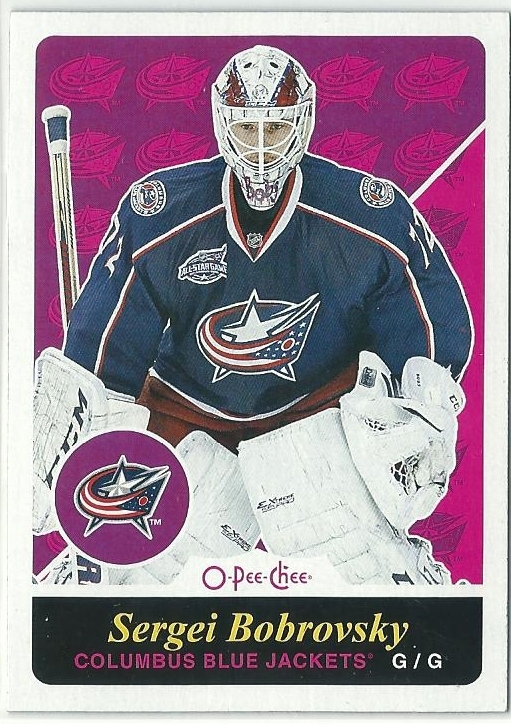 It's still early (just ask last year's Capitals) but if the Jackets could win their first-ever postseason series and eliminate Tampa, that would blow the field wide open. Jersey was once again far out of the playoffs, and they were slotted to select third in a draft that has two premium prospects - American center Jack Hughes and Finnish winger Kaapo Kakko. As luck would have it, the Devils won the NHL Draft lottery and will select first overall for the second time in three years. The Devils have actually won the lottery three times; in 2011 they selected Adam Larsson fourth overall - which was the highest they could move up under the old rules. I'm really excited for the Devils rebuild to bear fruit, assuming they draft Hughes to pair with Nico Hischier up the middle. Mackenzie Blackwood has enough potential in net that the Devils probably won't even pursue Bobrovsky, last year's first rounder Ty Smith is ready to make the team and GM Ray Shero has four picks in the first two rounds to play with. As for the playoffs, I'm not pulling for one team in particular just yet. I'd be happy if the Capitals could repeat, and I'd be just as happy if the Predators won. But Joe Thornton and the Sharks have to win eventually...right? I'm trying to watch more of the NBA playoffs this year, and I'll probably watch a game or two today. It's odd and a little refreshing to have a postseason without LeBron James; almost like the MLB playoffs without the Yankees. 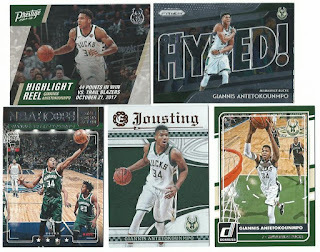 I don't know enough about the Western teams to have a favorite (anyone but Golden State would be fine) but I'm pulling for the Milwaukee Bucks to come out of the East. Kerry sent me some guilt-free basketball cards, which arrived Friday. 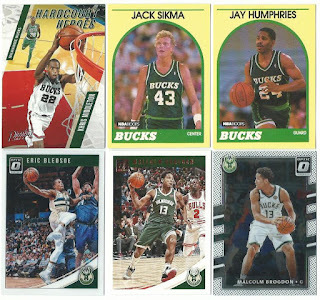 Someone else claimed Ray Allen specifically, but I got plenty of current Bucks including the Greek Freak..
..Bledsoe, Brogdon, and my birthday bud Khris Middleton. Jack Sikma was finally elected to the Basketball Hall of Fame last week, along with former Buck Sidney Moncrief and Vlade Divac, among others. Guess it was a good year to clear out some backlogged players - but I'm surprised that Chris Webber and (to a lesser extent) Tim Hardaway still have to wait. Speaking of the Hall, Kerry included a sweet Oscar Robertson Hall of Gold insert from Panini Gold Standard. The Jabari Parker holo parallel is my third from '15-16 Donruss. 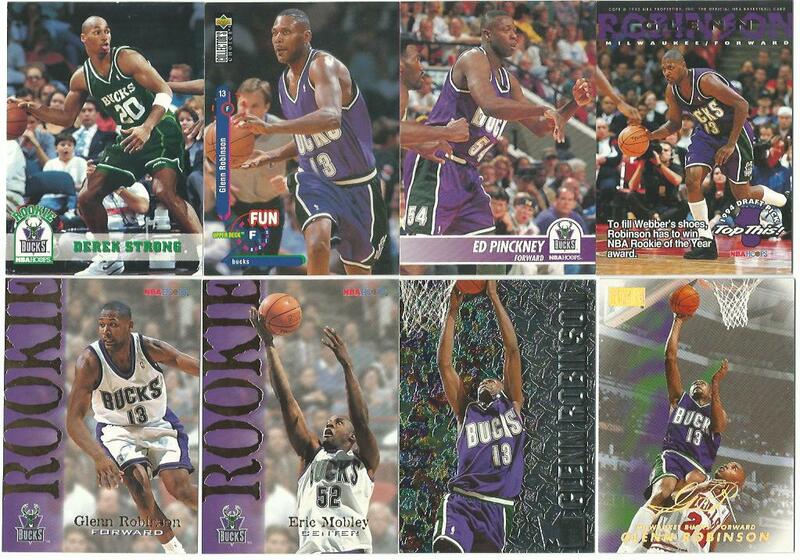 A handful of '90s Bucks, featuring "Big Dog" Glenn Robinson. Kerry also sent a couple Hakeem Olajuwon cards and a big Stack of Red Sox cards, which I'll show off in my next post. Thanks again for all the great cards! 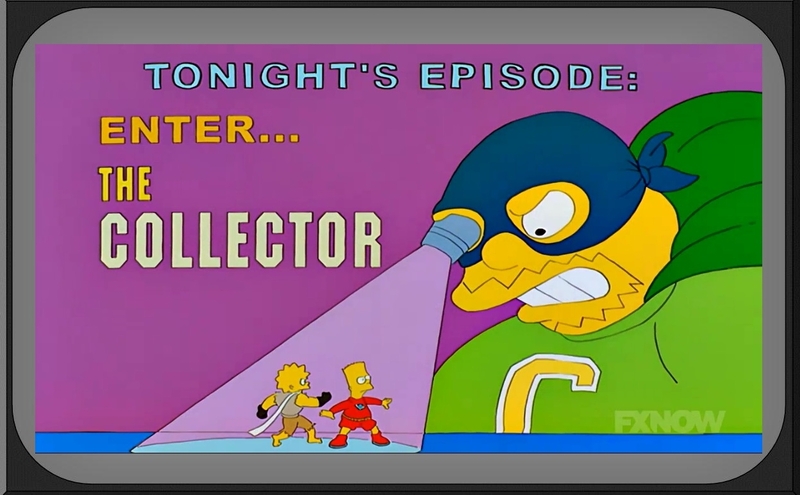 I'm hoping to finish cataloging my baseball cards today, but my daughter has a soccer game this afternoon. The weather is just too perfect to stay inside anyhow. Hope you're all enjoying your Sunday! That's a solid group of Bucks! As for Tim Hardaway in the HOF goes, I think that he might be waiting a while -- in our current PC obsessed culture, his old comments about gay player's will probably be sticking to him for quite some time, and would likely be rehashed ad nauseum were his name to ever be mentioned in conjunction with the HOF. It does seem like he's getting the Curt Schilling treatment. But at least he's contrite about it. Apparently there's some college scandal clouding C-Webb's candidacy..but I don't know if that's what's keeping him out. 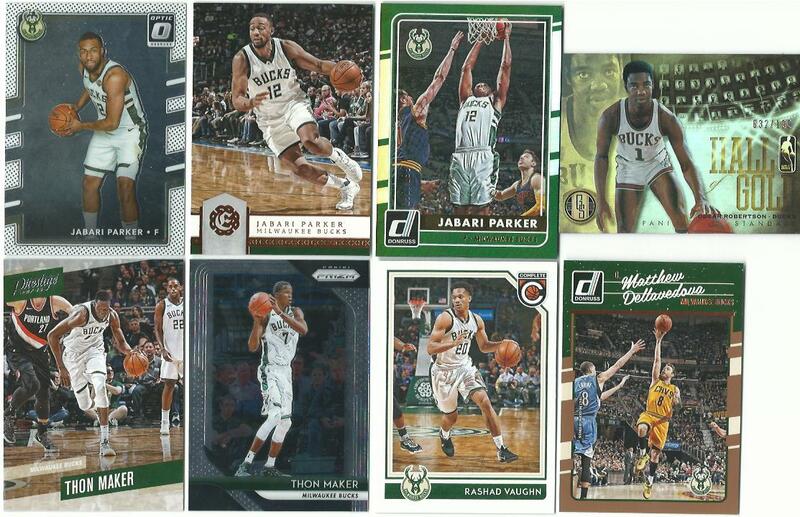 I'm having a flashback of me going all in on Glenn Robinson rookie cards. 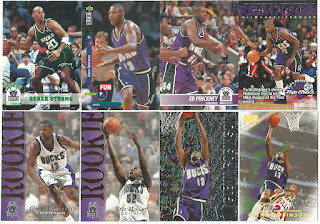 I bought a lot of 1994-95 basketball in search of Kidd, Hill, and Big Dog. Welp . . . so much for my Tampa Bay pick. I'm out already!